If you haven’t yet read why I choose to have a natural childbirth, you can learn more about it here. 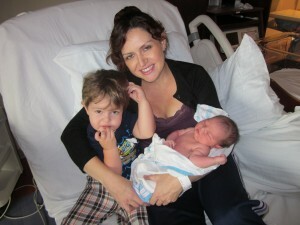 You can read my first birthing story here. When I was pregnant with my daughter, which was my second pregnancy, I saw a midwife the entire time. I knew immediately that I wanted to have a natural childbirth, but this time I wanted to give birth at a hospital with labor tubs. I wanted to have a new experience at a new place. I also loved the idea that the hospital I chose had an organic chief on site. The food selection was amazing and right up my alley! I had heard a few stories of women using hypnosis during childbirth and wanted to find out more about it. The more I learned, the more interested I became. I just had to give it a try! I had to make a choice between taking an actual class with an instructor, or ordering a home study course. I chose the home study course because it allowed me to learn in the comfort of my own home and on my own schedule. The kit I received came with several CD’s and a few workbooks. To get the bull benefits of the course, I had to work on it daily. Each day I was supposed to read a little bit from the books, do a few recommended exercises, and listen to some tracks on the CD’s. I always did everything at night right before bedtime. The hypnosis disks usually made me fall asleep because they relaxed me so much and I was worried I wasn’t “getting” it right because of that. The course clearly stated that falling asleep while listening to the disks was perfectly fine and I would still get the benefits, but I had a few doubts in the back of my mind. I went through the entire course twice just to make sure I had everything down. It probably wasn’t completely necessary, but if I do something, I like to make sure I do it right. I actually enjoyed everything the course had taught me. There were several different techniques that I learned for easing myself into hypnosis, and I got to chose the one that I felt was the most comfortable doing. During self-hypnosis, I was able to relax my entire body and mind and block off everything else. The course I took stressed how important it was to be positive about childbirth. There was one track I listened to every day that was nothing but positive affirmations. I was supposed to ignore people who tried to talk me out of natural childbirth. If someone told me horror stories about childbirth, I was supposed to let it go and not let it sink into my mind and make me afraid. I was also supposed to avoid television shows about “typical” hospital births because they always focus on the problems that arise in childbirth. I had contractions on and off for a few weeks before I actually went into labor. The night I officially went into labor, I waited until I knew for sure things were moving along. I put myself into hypnosis mode, but I was still able to function and do other things while “hypnotized”. My contractions were becoming more regular, but I wasn’t having any kind of pain at all. I called the midwife at the hospital and told her I was coming in. Once I got to the hospital, the nurses and the midwife didn’t think I was in labor because I was completely calm and relaxed. I was immediately sent to triage to make sure I was really in labor. I had to stay in triage until things started moving a little more. The midwife later told me she thought I was going to get sent back home. It wasn’t until about an hour later that I started to feel pain. I was then “checked” and had made incredible progress in a very short amount of time. Finally a tub was filled for me and I was able to go into my room. Once in the room, my contractions were super strong and it was hard for me to walk. My husband put on my relaxation music, and I turned off all the pain again by doing the exercises I had been practicing. I submerged myself into the warm tub water and immediately felt my body relax. It felt so amazing to be in that water. Like my previous experience, it seemed like once I was in the water, the baby was ready! But I managed to stay in for about 15 minutes or so just so I could further relax my body. After I got out of the tub, it was time to push. I continued to block off all the pain and just let my body do all of the work. I focused on the relaxing music, my breath, and the hypnosis techniques. It was a surreal experience. I delivered my beautiful daughter just hours after arriving at the hospital. It was like a dream birth and all the nurses wanted to come and see me because they had never witnessed a “Hypnobirth” before. It was the strangest and most empowering experience I have ever had. The total length of my labor lasted for maybe 5 hours and only about 2 of those hours were painful. Although I can’t vouch that my labor was completely pain-free, it was by far easier and shorter than I could have imagined. I felt so amazing afterwards. I had so much energy and was able to nurse my beautiful new baby without any trouble at all. Because I had such an easy birth, I was released from the hospital a lot earlier than most moms because I was up and walking around and feeling great. The doctors at the hospital who happened to come into my room were amazed and couldn’t believe I just had a baby. They weren’t used to seeing patients who didn’t go through the “standard procedures” of a typical birth. Most moms who are recovering from child birth are stuck in bed and kind of “out of it” from the all the drug interventions. I didn’t need any drugs before, during, or after the birth. My body healed really quickly and I was back to my normal self in no time. It was a really empowering experience and if you have any interest in natural childbirth, then I recommend you learn as much as you possibly can and get all the support you can! It is all worth it! Overall, I highly recommend trying hypnosis for childbirth. It was an amazing experience and I really hope more women consider using hypnosis during childbirth!